In this book chapter, authors Steve A. Mora MD, Bert Mandelbaum MD, and Holly Silvers MPT. focus on articular cartilage damage in the knee and its clinical implications in the soccer athlete. 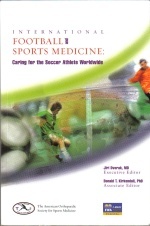 This book chapter is part of a greater body of work called International Football and Sports Medicine: Care of the Soccer Athlete Worldwide. Orthopaedic Concerns: Hip, Knee and Ankle The combined resouces of the American Orthopaedic Society for Sports Medicine (AOSSM) and the Federation International de Football Association’s Medical Assessment and Research Centre (F-MARC) have made possible this collection from more than 40 internationally-respected contributors.